Half the Wheels - Twice the Fun | Hupy and Abraham, S.C. If you're contemplating a get-a-way from the drudgery of your daily routine and have your sights on Las Vegas, I have some good news for you. Once your flight lands, instead of hitting the car rental desks to book that Chevrolet mid-size you might want to consider renting a motorcycle. No, you don't have to hire a taxi to take you to the dealership or to a motorcycle exclusive rental business, you can check one out right from the Enterprise Rent-A-Car desk at its Flamingo Road location just off the Strip. They'll even come and get you as part of their customer service plan. 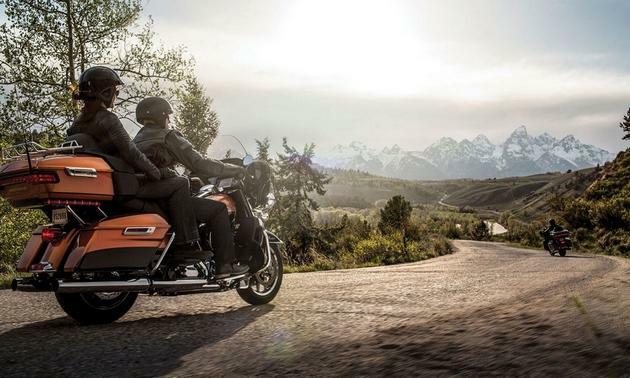 Of course, you'll be limited to only one of six Harley-Davidson models but they're excellent bikes for those scenic tours to the Grand Canyon, Hoover Dam, Death Valley, Lake Mead or even the national parks in Utah. Of if you prefer, you could take a traffic starved highway to nowhere if you just want to get out and explore. Enterprise became the first major car renter to offer motorcycles as an alternative choice to four wheel transportation. Although more expensive than renting a mid-size or even full-size car, the bikes are still cheaper than the ExoticCar Collection offered by Enterprise. The October 16, 2013, launch of the new motorcycle rental division started out with only 8 motorcycles in 5 models. Today, Enterprise offers 7 models and has a fleet of 60 motorcycles at its Las Vegas location. The good news is Enterprise is expanding to other locations. The rental rates of about $161 per day are three times what a Chevy Spark would cost, but if you're out touring the desert highways you're not losing money at the Black Jack tables and are probably coming out ahead in the long run. The biggest competition for Enterprise is Eagle Rider which is based in Los Angeles and has locations nation wide including Las Vegas. Eagle Rider offers some Harley-Davidson models in additon to Asian and European models including BMW and Honda. Eagle Rider also offers guided and non-guided tour packages with its rentals. Many Harley-Davidson dealers also offer rental bikes and all the rental businesses charge about the same rental fees as Enterprise. The reason motorcycle rental prices are so far above car rental costs is the insurance liability costs and the maintenance costs. Some might find Las Vegas to be a strange choice to test the motorcycle rental niche, since a study by Allstate Insurance in August, 2013, found Las Vegas to be one of the least safe places to drive (130th out of 200 big cities surveyed). But when you consider Las Vegas has 40 million visitors a year and a portion of those visitors, including foreign tourists, are eager to visit the many nearby attractions, motorcycles will be a very appealing choice of vehicle to them. Still more good news; Enterprise Motorcycle Rental is considering offering a discount to Road Guardians members, so that's one more benefit and reason to join Road Guardians. We'll keep you posted on when and where Enterprise expands its business. Although Enterprise will furnish a free helmet to you (Nevada is a mandatory helmet state) you must have a motorcycle endorsement on your driver's license to rent a bike.